"It doesn't matter who you are, whether you're male or female, whether you've tried to lose weight in the past or whether this is your first time ever. 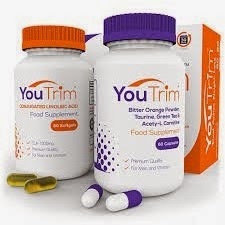 YouTrim's ultimate weight loss pills are 100% SAFE AND NATURAL - making it a breeze for nearly anyone to lose weight FAST with YouTrim slimming pills"
I was sent a 30-day supply from YouTrim to review. The price for this kit is $29.97. Shipping is free with Amazon Prime. This 30-day supply arrived to me in perfect condition. There were no dents, defects, nor issues during shipment. The box is white, and it has orange and purple accents. The box measures 5.0" x 4.5" x 2.5". The back of the box has the distribution information, supplement facts (and ingredients) of each bottle, important information, and warnings. This product is 100% pure, and is manufactured in a GMP-certified facility. Both sides of the box are the same, but one is purple and the other is orange. The bottom of the box has company contact information, lot number, and expiration date. The box opens from the sides, and each side has a safety seal. When I opened the side of the box, I found two bottles and a set of instructions (again, color-coded). The purple bottle (the capsules) is your CLA. The bottle provides all pertinent information. The second bottle (the gel caps) is where you'll find an energy blend. Each bottle had its own safety seal. The capsules look different, but they work in conjunction with one another. I'm always looking for a weight loss product that is better than the previous. I've really been into the whole 'double-formula' thing lately. I really like this blend because it has everything that I take separately in one dose. I take one of each in the morning, and at dinner. Check out my First Impression video! Love that it is 100% natural. Provides a bunch of energy. I'm really enjoying this supplement. I switch all of the time because I do not want my body to get 'accustomed' to any one sort. I really like how each capsule is different, but they work great together. I can tell a noticeable difference within 20 minutes of taking these! Are you wanting to try the YouTrim - Dual Action Natural Weight Loss, too? Click the link below, and order away! Proto-col Slim-Fizz is a distinct appetite suppressant the groundbreaking fibre Glucomannan, which is an organic dissolvable fibre derived from high quality fresh Konjac.